This strategy is intended to position the United States to respond effectively to challenges and emerging opportunities arising from significant increases in Arctic activity due to the diminishment of sea ice and the emergence of a new Arctic environment. It defines U.S. national security interests in the Arctic region and identifies prioritized lines of effort, building upon existing initiatives by Federal, state, local, and tribal authorities, the private sector, and international partners, and aims to focus efforts where opportunities exist and action is needed. It is designed to meet the reality of a changing Arctic environment, while we simultaneously pursue our global objective of combating the climatic changes that are driving these environmental conditions. 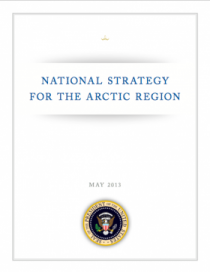 For the National Strategy for the Arctic Region, see here. For the press release issued by the White House, see here.